England`s West Country has long been a honey pot for collectors and admirers of pottery – in the 1900s souvenir hunters collected those brown and cream jugs from the likes of Watcombe and Aller Vale, bearing strange mottoes in dialect such as ‘Go aisy wi` it now’. No doubt, at the time, these pieces were as strange and dramatic to those used to seeing fine Wedgwood porcelain, as Troika was to seventies folk reared on a diet of Meakin and Midwinter. Potteries such as Tintagel, Dartmouth, Celtic and Boscastle thrived, and today it seems that every twisty, narrow lane in the area has at least one sign pointing to a ‘studio’. Whether it is the clay, the light, the pasties or just something in the water, the West Country is practically a euphemism for pottery. 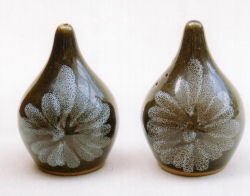 Amongst the wares, collectors often find vases, jugs and bowls, often unmarked, sporting an unusual grey/green glaze, and bearing a large daisy motif. Immensely tactile, these smooth, definitely hands-on pieces are a delight, yet sometimes dealers seem at a loss to name the maker – they guess at Spanish, and I have even heard them described as ‘Russian`. In fact, these attractive pieces emanated from the Lotus Pottery in Stoke Gabriel, South Devon, in the1960s and 70s, and today are finding favour with enthusiasts who enjoy the way the smooth, flowing forms and muted colouring fits in well with today’s décor. The Lotus Pottery was formed by Michael and Elizabeth Skipworth in 1958, soon after they purchased Old Stoke Farm. This limestone-built farm, set in a garden and cider orchard, was a perfect place for such a venture, with plenty of barns to transform into workshops. Stoke Gabriel is a particularly pretty place, situated on a creek of the River Dart. The centrepiece of the village is the beautiful mill pond. Tourists come from near and far to admire the surroundings and to sample cream teas. For years it was possible to buy stunning Lotus pottery too. 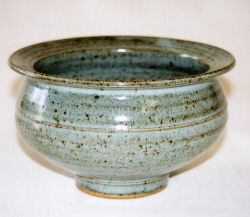 Michael and Elizabeth met at Leeds College of Art, and it was there that they formed Loversal Pottery, which they named after Michael’s place of birth in Doncaster. 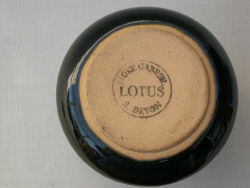 When they moved to Stoke Gabriel they decided on the name of Lotus Pottery, and so were able to continue marking their wares with the initials LP. However, it seems that much of their work, especially smaller pieces, do not bear the initials, while often, even if they are marked, the LP is difficult to see and is easily overlooked. No doubt the attractive surroundings provided plenty of inspiration, and during the twenty-five years or so that Lotus Pottery was in production, Michael and Elizabeth experimented with various techniques, designs, clays, colours and glazes. By 1968, a variety of finishes were available including speckle, Dartside Green, white on red, and blue on blue, while in 1974 a blue on white Loire range was introduced. 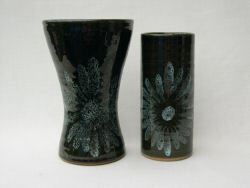 However, the most characteristic glaze from Lotus was the dark grey/green finish with the daisy motif. It proved one of the top-selling lines for many years, and was known as petal on sage. A blue version, petal on blue, was also obtainable. Sage green was all the rage in the seventies – ‘natural’ colours and stylised designs were very popular, possibly a reaction to the psychedelic, brain-boggling colours and patterns of a few years before – and the vases, bowls, mugs, jugs and assorted kitchenware adorned many homes. The items were normally bought by tourists to the area as a welcome change from the pixies, seagulls and sheep which were sold in most souvenir shops. Lotus ware was stocked by the more discerning retailers! The most distinctive Lotus piece was a stylised bull, smooth and curvy with barely-there features, vaguely resembling the animals produced by the Russian Lomonosov factory in its simplicity. Today, this is the piece that many collectors begin with; not only is it easily recognisable, but its attractive shape allows it to blend perfectly into a modern home. Each bull featured an elongated, arched body with the head lowered. There were no eyes, nose or mouth, but sometimes a few tendrils of moulded hair could be seen between the horns, though most had smooth heads. The legs were very short and narrow, and this was probably the reason why the creatures tend to be unmarked – there was nowhere to impress the LP motif without detracting from the simplicity of the design, and the undersides of the feet were to small to bear a stamped mark. Although at first glance they might appear identical, these bulls vary considerably, especially with regard to the motif which appears on each flank. Usually, the daisy is found, but other designs include a leaf, a fern or a set of interlinked circles. Made in several sizes, from a baby at five inches through to an impressive granddad, thirteen inches long, the shade varies from a grey-green to a rich deep olive. The petal on blue colouration is also very striking, with the blue being a deep, inky colour while the daisy motif is a pale blue/grey. The bull was actually designed by Elizabeth Skipworth in a moment of inspiration; she was amazed at their popularity. A herd of the bulls lined up on a shelf makes a stunning display. Other stylised creatures appeared in this range, though they seem harder to find. They included a bird, owl, cat and a horse’s head, and had the same smooth and glossy appearance. There was also a wide selection of domestic ware such as dishes, egg cups, cruet sets, mugs, jardinières, jugs, vases, bowls, candle sticks and coffee pots. Some of the pieces were impressed with the LP motif in a circle, but many were stamped on the base ‘Lotus Pottery Stoke Gabriel’. However, a large amount bore no mark at all. Lotus was very experimental, and though the petal on sage shade was probably the most popular, they produced various other colours and designs, including a range of pots made from white clay decorated with coloured slips which were then finished with a transparent glaze. This range dates from 1959. Coloured glazes were in use by 1965, and everything was decorated and glazed by hand using a rich array of West Country colours. Chosen clays were red or buff and the pots were fired at high temperature using modern electric kilns. The pottery achieved an accolade when the Design Council accepted the Lotus Alpine range, introduced in 1966, for the Design Index. Alpine items were white at the top with sage green below. The insides were white. In 1972, Michael designed a innovative potter’s wheel which featured a removable centre, allowing pots to be removed easily while still on the base. He registered this as the Lotus Wheelhead, and it proved so successful that it remained in production right up to 1990 before the marketing rights were sold. Thousands of discs and heads were sold world-wide throughout the eighteen years it was in production. At its peak in the mid-seventies, Lotus Pottery employed seventeen staff, amongst them a Glazer, Pugger, Jolleyer, Caster, Jigger, Decorator, Kiln Packer, Fettler and Throwers, and it eventually became quite a tourist attraction as visitors were allowed to watch the pots being thrown. 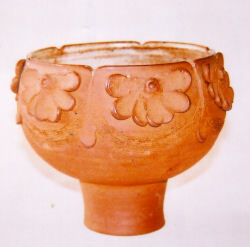 A gallery in the studio sold the Lotus ware, as well as other crafts such as paintings and sculptures, and catalogues were available showing the various items produced by Lotus, especially the vast range of the favourite petal on sage. Sadly, things couldn`t last – by the 1980s, a huge revival in crafts and hand-made products resulted in numerous studios springing up in Devon and the West Country. It appeared that almost every village had its own pottery workshop, and the competition forced Lotus to close down much of their enterprise. The situation was made worse by a dramatic rise in rates. However, never one to be beaten, Michael decided to change tack, and built a wood-fired kiln, experimenting with stoneware. He produced some exciting effects, creating interesting colour variations when ash became deposited on glazed pots, while some clays achieved a unique ‘toasted’ look after undergoing the flames from the wood. Today, Lotus pottery is beginning to appear at auctions, and, just as in the 1970s, it is the petal on sage range which is proving most popular, especially the bulls, with the larger sizes reaching prices of £50 or so. Some collectors, though, are aiming to acquire examples of all the patterns and finishes produced by this creative studio; they face a busy time ahead.